​Our desire as Marian Sisters of Santa Rosa is to live and love at the heart of the Church. This is, in part, lived out through our charism of living the fullness of the Church’s liturgical life. 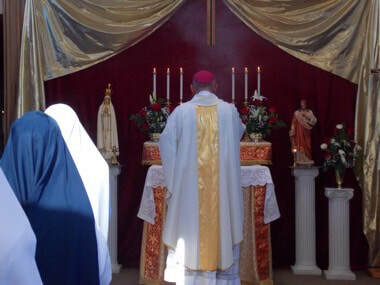 When our Holy Father Emeritus Benedict XVI issued the Moto Proprio Summorum Pontificum and the accompanying letter to the Bishops in 2007, he envisioned that the peaceful mutual enrichment of the Extraordinary and Ordinary Forms of the Roman Rite would be "an interior reconciliation in the heart of the Church." This Moto Proprio concerning the place, usage, and celebration of the Extraordinary Form of the Latin Rite Liturgy influenced the founding of our community and continues to influence the living of our consecrated life. Our good Bishop, Bishop Robert F. Vasa, invited our Superiors to found a community to make visible the invisible reality of God’s love in the Diocese of Santa Rosa. By this ecclesial action, the Holy Spirit called forth our charism of communicating our Catholic faith through joyful evangelization and a rich liturgical life. Bishop Vasa formally approved the Constitutions of the Marian Sisters of Santa Rosa and canonically erected the community on January 4, 2012. Since our founding, by God’s grace and the enthusiastic support of the good people of the Diocese of Santa Rosa, the community has grown and its active apostolates have expanded. 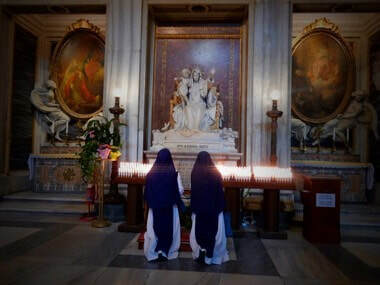 Committed to the spread of the faith in our Diocese, every Sister teaches the faith in some manner. While some are formal classroom teachers, most of the Sisters exercise the charism more broadly through children’s catechesis, faith formation groups, retreats and camps, and any other way in which God’s will is made manifest. We have the privilege of participating in both Forms of the Roman (or Latin) Rite in our chapel several times a week and it is our honor to provide the choir for the Extraordinary Form High Mass at the Cathedral each Sunday. Our communal understanding of the both Forms enables us to appreciate and share the full richness of this key aspect of the Church's life. We strive in all our apostolates to give the traditions of the Church their "proper place" while living fully present in our current age. Called to a life of total consecration to Christ and His Church, we take the Blessed Virgin Mary as our inspiration and model and dedicate our time and talents completely to the service of God and neighbor. We recognize the evangelical counsels of poverty, chastity, and obedience as a gift of the Most Holy Trinity which we embrace by vow in loving response to our call to religious consecration. These vows constitute the essence of our religious lives and impart stability and higher consecration. They lovingly compel us to live as Christ lived in areas which cover our whole life: possessions, affection and autonomy.